Capt. Richard Stanczyk Sr. got out with friends Capt. Dave Peck and Capt. Max Gaspeny for some late afternoon bonefish fishing in Islamorada. Being January cold fronts are a likely possibility and that is exactly what was up and coming on this evening. Sometimes though the prefrontal conditions really set the bonefish off… They know it is going to be cold for a few days and they dont like to feed when that happens. But before it does they get their fill of shrimp and crabs and such! The boys fished from 3:00 until dark and had banner fishing. All in all they ended up with nine bonefish in islamorada! You don’t hear numbers like that too often. Nice size fish too some in the 6 to 8 lb range. Even a double header was to be had. Of course now the water temperatures have dipped back into the 60 degree range and the bonefish are not quite as happy, but when it warms up again you can bet they will be back on the prowl. 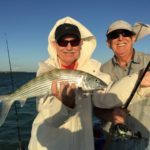 If catching a florida keys bonefish in January is on your bucket list, check out fishing with some of these guides! Well Capt. 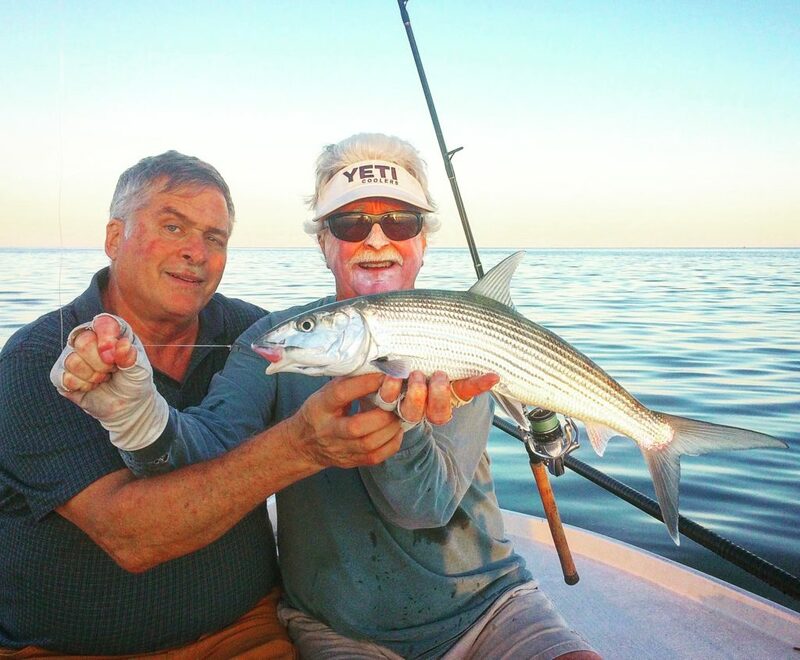 Richard Stanczyk Sr. got out with Rich Hastings of Bud n’ Mary’s for a little late afternoon bonefish session. We’ve had a mild front hit the last few days though temperatures had warmed back up slightly to the low 70s (water temps) anyways. This afternoon it was slick calm too with a radiating warmth before another much colder front hits us Wednesday night. 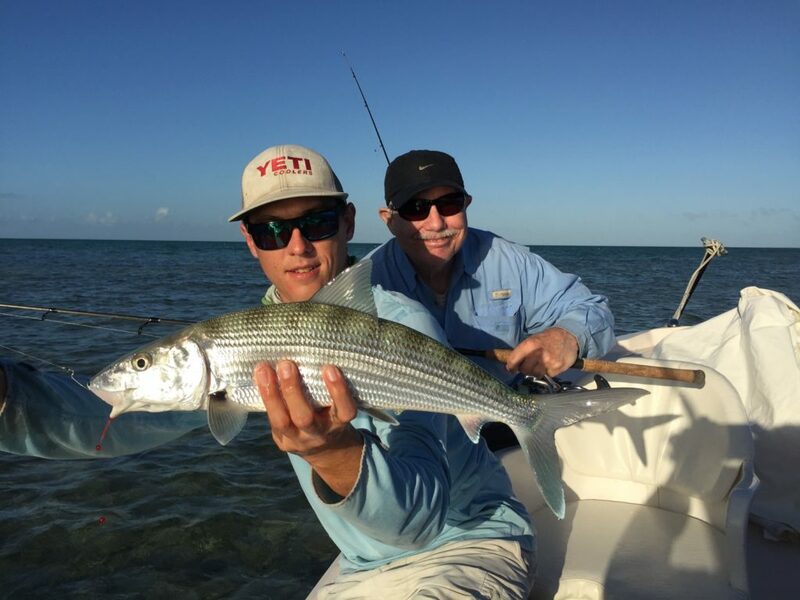 The boys managed 3 bonefish stake up fishing on the flats to ring in the new year the right way! Fishing for bonefish with shrimp did the trick, laying baits on the flats in known ‘lanes’ that bonefish cruise in. Winter time can still be productive for the grey ghost, though it will always be best when the water temps are above 70 degrees. Give me a call if you are interested in trying your hand at catching a bonefish in islamorada! Capt. Richard Stanczyk Sr. got out again with Rich Hastings and Capt. Vic Gaspeny for some afternoon bonefish fishing sessions. Last night they boated 6 bonefish along the atlantic side of Islamorada, late in the afternoon all the way until dark. Capt. Stanczyk said with the ‘super full moon’ there was more light later into the evening, and the bones were responding. This particular spot is a higher, incoming tide spot, and it produced well. Tonight the team got out again, this time however fishing the bayside of Islamorada. 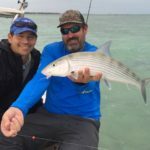 Some of the strip bank flats in the bay can produce larger bonefish, and many of those areas have been much livelier in recent years. They caught 2 bonefish tonight, and had a fun time doing it. Good size fish too, with several in the 5 to 8 lb range. Looks like we are getting a blast of cold weather finally this weekend, so that might put a slow down on the bones. Though pre-frontal could be very, very good, which will be Friday. If the team gets out, i’ll let you know, or if you are interested in going give me a shout! Capt. Richard Stanczyk Sr. got out with friend and fellow Capt. 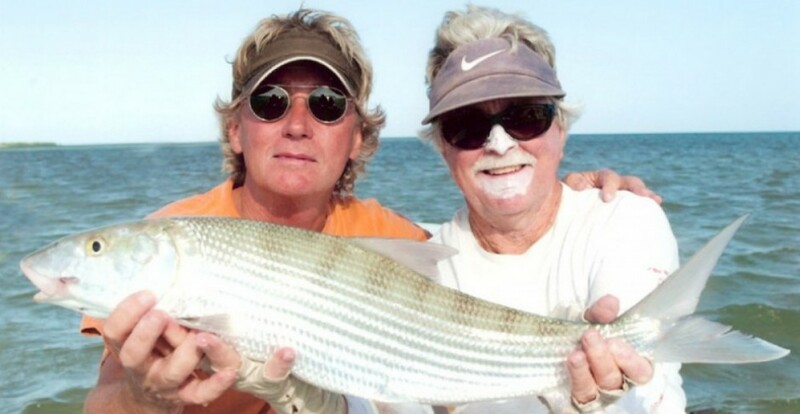 Vic Gaspeny and friend Daryl Pruett for an afternoon bonefish session. 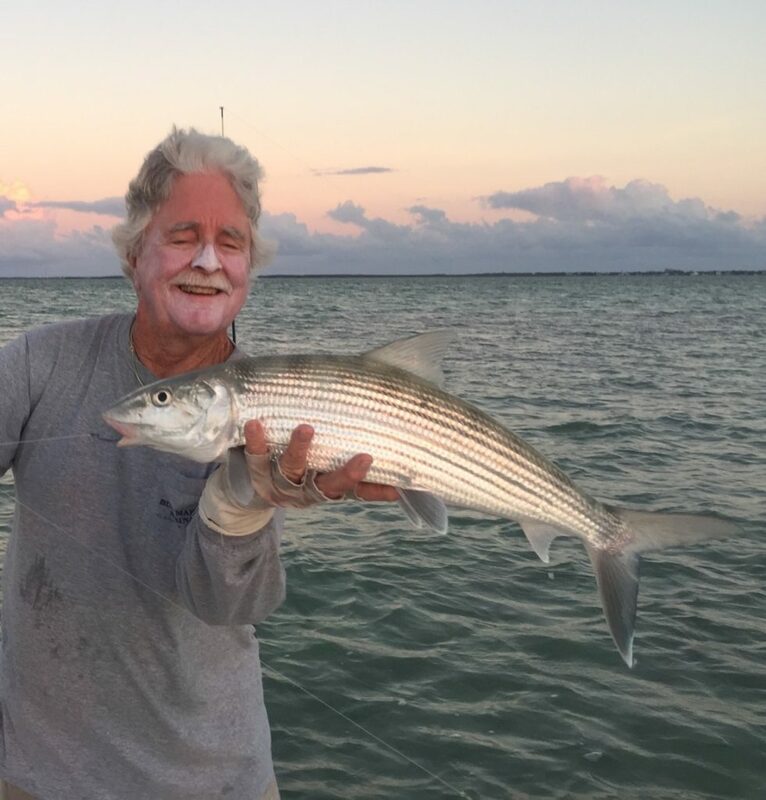 The december bonefish in islamorada can be hit or miss. But with the very warm weather right now conditions have been ripe. They fished the afternoon late incoming tide until sunset. The bonefish flats of islamorada on the alantic ocean side have been looking very good as of late. The grass is returning to many of them with the better water quality we’ve been experiencing. Fishing was red hot and they landed 6 bonefish in total. This was all accomplished by ‘dead boat’ fishing, where they cast shrimp out and let ’em sit. Bonefish cruise by and smell the shrimp scent, and then soon find the bait and it’s off to the races. A bonefish can strip off 100 yard of line in a hurry, so they are always a fun battle. If things stay warm which it looks like they will for a little longer at least, this fishing may continue to stay hot. Give me a shout and we can get you put on ’em! Capt. 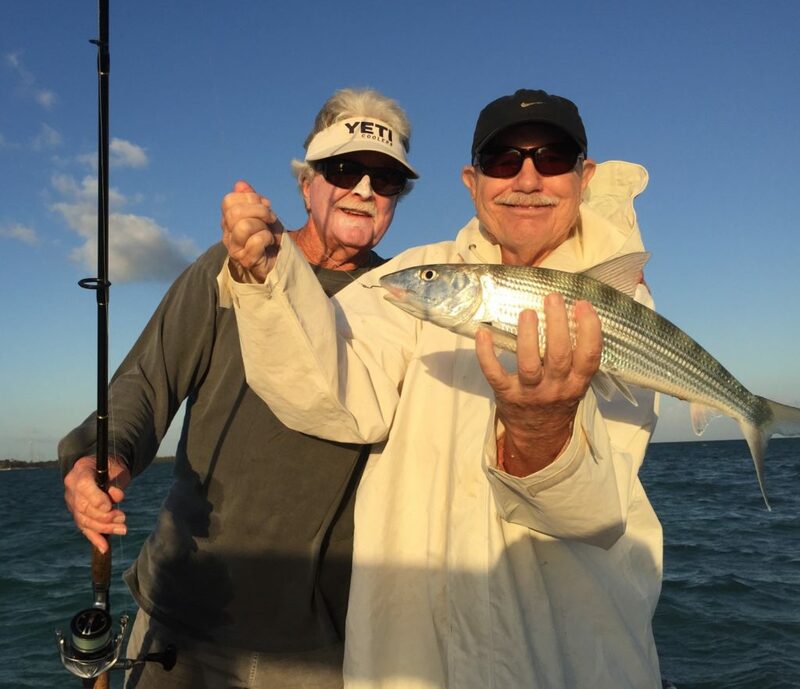 Richard Stanczyk Sr. was on them this evening fishing with friend and fellow captain, Vic Gaspeny. The boys had great bonefish action stake up fishing on the atlantic ocean side of Islamorada. The shallow flats are home to perusing bonefish who often are in search of a meal. That meal consists of shrimp mostly and they had plenty of them. They ended up landing 5 bonefish on the trip! Just spectacular fishing especially for this time of year, as often the cold front we get can hinder the bonefishing sometimes. However it’s been awfully warm for November so anything is possible right now. The last hours of incoming tide in the area gave enough currently flow and water so they could fish up shallow, where bonefish like to be when they can. This fishing may hold up through December if things stay warm, so if you are interested give us a shout! 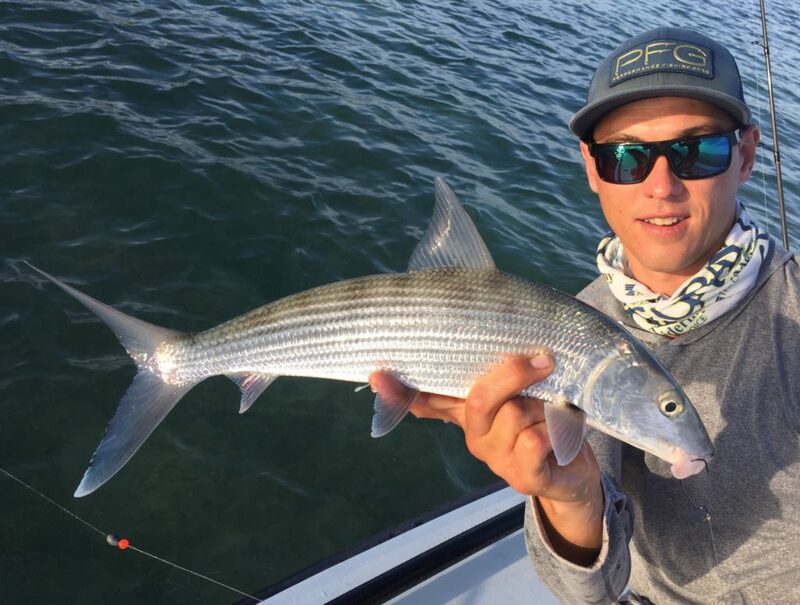 The islamorada bonefish flats are looking as lively as ever. Capt. Richard Stanczyk Sr. was out the other night and said the water was gorgeous in many of his favorite areas. We’ve been dealing with some ‘algae blooms’ which sometimes bring nasty water into some of these areas. Of course the bonefish do not like this too much and so they move out. But the other day it looked as pretty as it gets in almost all the normal areas we fish. 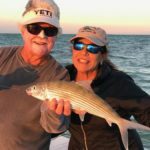 He had his girlfriend Jo Ann out the other night and they landed two nice florida keys bonefish. They were dead boat fishing just with some shrimps out on the bottom. It was a gorgeous afternoon and the fishing was good right around sunset. 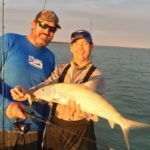 As november is coming to a close we enter december bonefish fishing season in islamorada. Typically the winter months are not quite as productive as we can get cold fronts. Though occasionally if you catch it right, the day of a front coming in for instance, it can be insanely good. The fish go into a feeding frenzy, knowing the temperatures are about to plummet 10 or 15 degrees. Obviously it’s hard to predict this far out ahead of time, but if you are here and you know in a few days a front is coming, it’s something to think about if you’d like to catch a bonefish in islamorada. Capt. 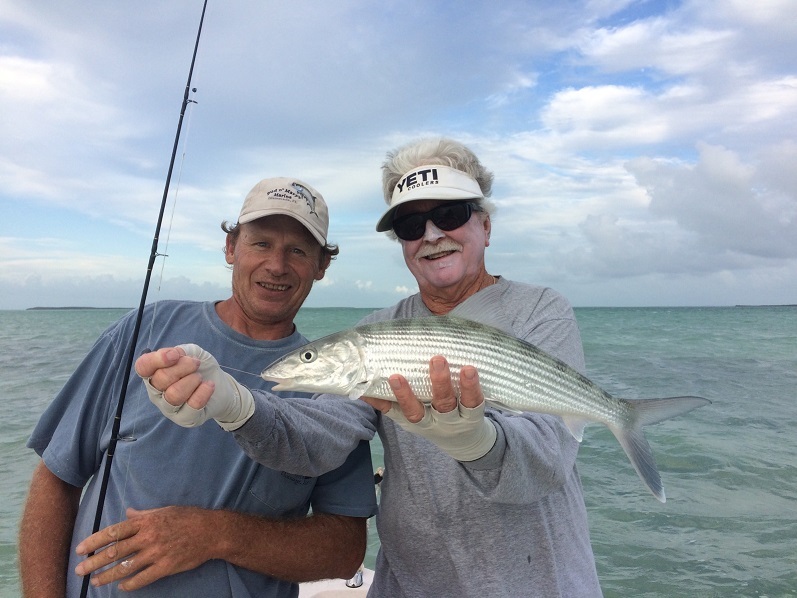 Richard Stanczyk Sr. got out with bud n marys employee Marlin after some bonefish for the afternoon. 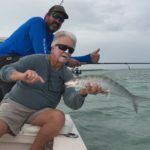 He said conditions were a little tough with not much moving water and some algae still around in many of his favorite islamorada bonefish flats. 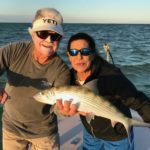 They were able to find one though and Marlin landed his first bonefish! A nice 5 lber or so, not huge but decent. 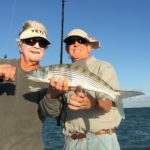 The flats fishing in November in Islamorada has been overall decent though we look to be getting a cold front early next week so it may slow down temporarily. But sometimes preceding the front, or right afterwards when it warms up a little, it can be very good fishing! Hopefully I’ll have some more to add to the florida keys bonefish report here soon. …And just like that the ‘bone bite’ has turned back on! Capt. 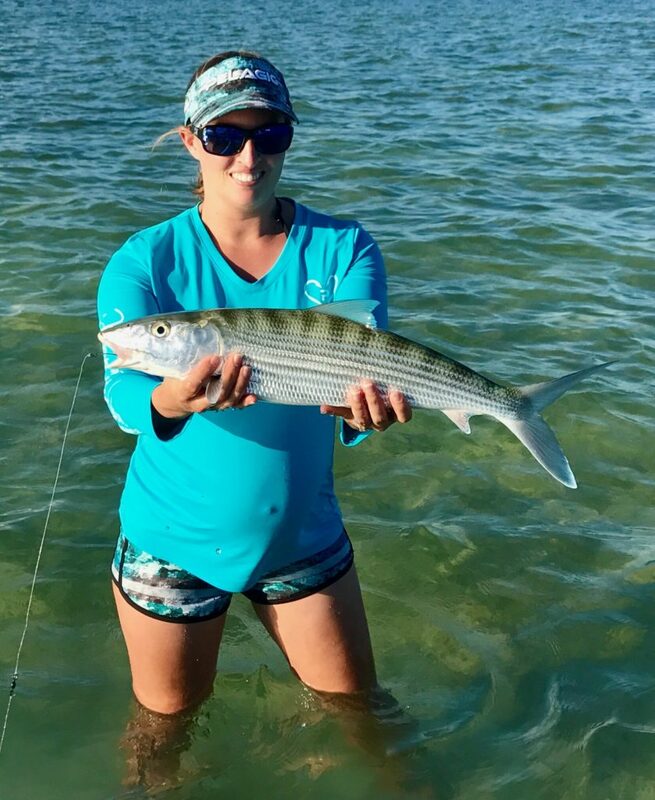 Richard Stanczyk Sr. got out with his daughter in law Sara Stanczyk yesterday afternoon for a little bonefish fishing in Islamorada. They did the stake up thing and the bite was on! They landed 4 bonefish, fishing the afternoon falling tides. The weather has still been phenomenal for November, with calm winds this week and temperatures in the mid 80s during the day. 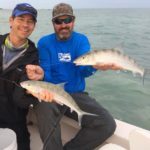 This is ripe for certain types of fish – including bonefish, permit, and tarpon! They did think they had a possible permit take too, however unsure at this point as all they got back was a crushed crab. If you are wanting to try your hand at catching a bonefish, give me a shout! Capt. Richard Stanczyk Sr. got out for another late afternoon/evening trip with friend Andy Newman. Andy is in charge of the TDC (tourism development council) for monroe county – Florida Keys & Key West. They’ve been friends for a long time and have fished together often over the years. Fishing was not great but they did manage one nice bonefish. It was a gorgeous evening out there too with the continued light winds and temperatures in the low 80s. It would feel like summer time in most places. No significant cold fronts in site as of now though we are suppose to be getting some wind perhaps this weekend or early next week from a very weak front. This could be good for the stake up bonefish fishing, especially if water temperatures stay what they are. If you are after bonefish in november in Islamorada, it is definitely possible right now.